Marcus Maddison scores for Posh against Charlton. Photo: Joe Dent/theposh.com. 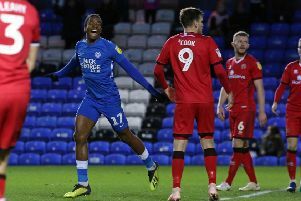 Marcus Maddison grabbed all the headlines as Peterborough United beat Charlton 2-0 at the ABAX Stadium today (April 1). but central defender Jack Baldwin was a deserved winner of the sponsors’ man-of-the-match award. Baldwin defended superbly as Posh kept a clean sheet for the second League One match in a row. POsh striker Junior Morias tries to get a shot on goal against Charlton. Photo: Joe Dent/theposh.com. Posh midfielder Leo Da Silva Lopes challenges Charlton's Adam Chicksen for possession. Photo: Joe Dent/theposh.com. Martin Samuelsen: (for Forrester, 72 mins). Andrew Hughes: (for Binnom-Williams, 76 mins).